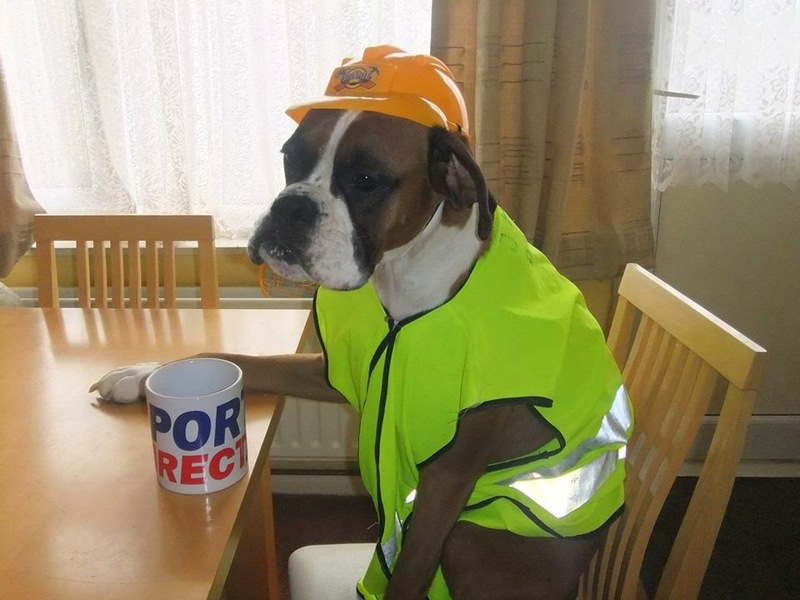 Ready For Log Home Maintenance & Repair? Log Home Finishing can make your logs look like this. This log home cabin is in Evergreen Colorado. The logs were prepared with glass media blasting and further sanded using the Osborne Brush. Sashco Transformation Log and Timber finish was used to stain the log home and the log chinking is Sashco Log Jam chinking in the very popular buff color. Colorado Log Home Finishing is the best company in Colorado for your log home cabin maintenance. 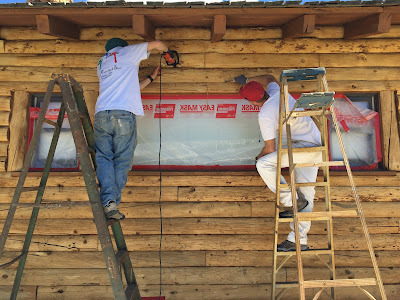 We begin projects with a full inspection of your log home to determine what has been done in the past to seal the log home and what needs to be done now to restore and seal your log home. Log homes need quality application of stain and chinking and good products from Sashco and Permachink when applied properly to the logs should last for many years. The goal of Log Home Finishing is to provide a quality, desirable finish on your log home which can be easily maintained into the future. 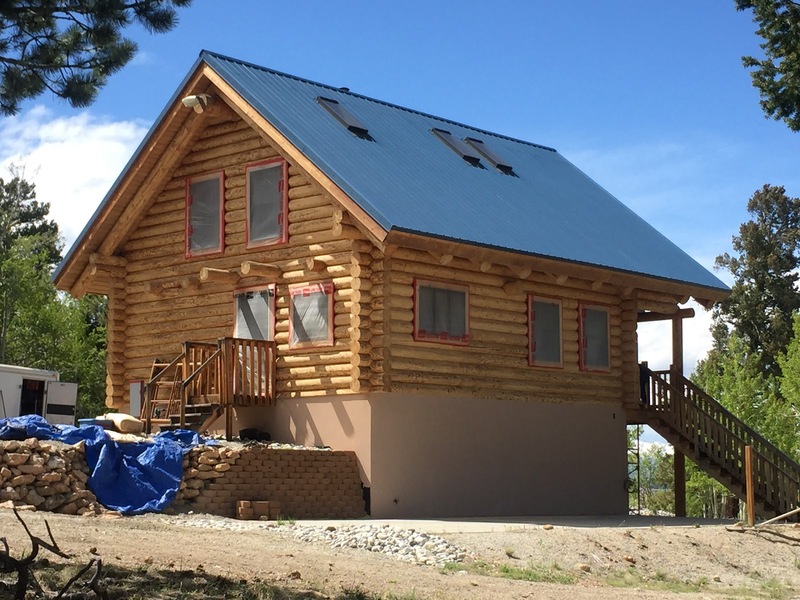 If you own a log home in the mountains of Colorado, Log Home Finishing understands your need to protect your log home cabin investment. As you drive around the mountain communities of Breckenridge, Bailey, or Bueana Vista, Colorado you will observe many styles of log homes, d-log homes, sweedish cope and full round custom log homes. Many of the log homes in Colorado were built between 10 - 20 years ago during the big boom log home construction times which have come and gone. Building of new log homes is not as popular now, but purchasing existing log homes are even more popular now and are a huge investment. Part of the log home investment involves maintaining the log home and sometimes even log home restoration. Modern log home sealing products from Sashco and Permachink do a wonderful job of protecting a log home however these log sealants must be maintained to do their job to seal the log home. Permachink for example recommends washing their stain Ultra-2 log stains with Permachink Log Wash annually in order to maintain the finish. 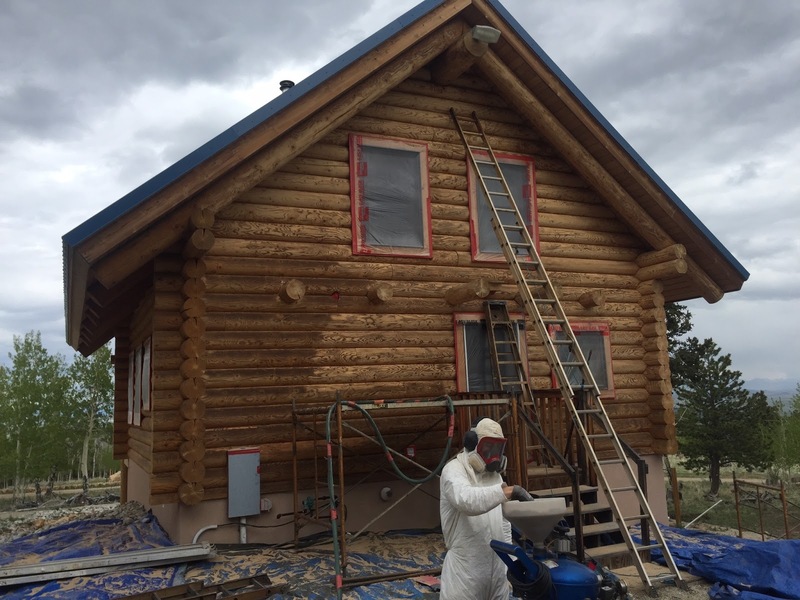 Sashco, a Colorado company produces log stain and recommends re-coating their Capture / Cascade and Sashco Transformation finishes every 2 - 3 years to maintain the high quality finish to protect the log home. Unfortunately too many log home owners neglect the maintenance interval re-coating of stain and allow the logs to get to the log home restoration phase where simple re-coating is not enough. Log Home Finishing recommends re-coating the finish on your log home often to maintain the integrity of the stain and to protect the logs. Re-coating Permachink Ultra-2 stain is as simple as washing with Log Wash and re-coating the Lifeline Advance topcoat every 2-3 years. Sashco Capture / Cascade gets pressure washed to clean every 2 - 3 years, and then the topcoat Cascade is applied as a recoat to add life to the log finish stain and give a nice even finished sheen to the logs. Removing old chinking from d-log cabin Meeker, Colorado. The mountains of Colorado have more log home cabins like this one than anywhere else on Earth. UV damage and water and a general lack of log home maintenance over the past 10 years have lead to this log home getting damaged. Log Home Finishing in the photos below is media blasting with walnut shell to remove the old finish stain on this log home restoration project. The log home stain had turned dark and was in need of log home maintenance in order to protect the logs and seal the log home properly. Log chinking had not been applied to the logs so this log home cabin near Hartsel, Colorado in Park County, Colorado will be chinked with Sashco Log Jam chinking and stained with Sashco Capture / Cascade log stain, the best log home water based stain. 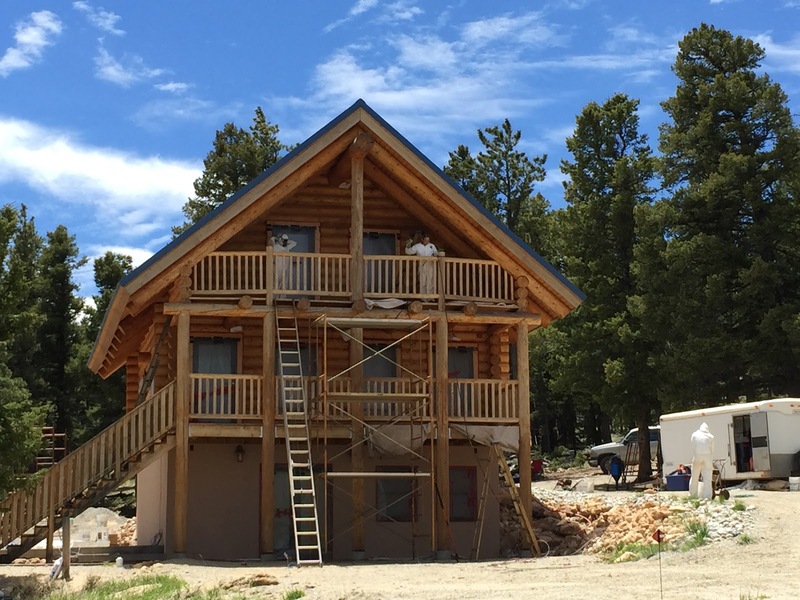 If you have a log home in need of repair or log home care in Colorado contact Log Home Finishing for a cabin maintenance inspection to determine how to maintain your log home and determine the cost of maintaining a log home. Log Home Finishing uses the best log home maintenance supplies available including stain from Sashco, Sikkens, and Permachink to stain, chink, and seal your mountain log home cabin in Colorado. This is a video of a log home restoration project near Colorado Springs, Colorado. The Log Home Finishing crew is media blasting the logs with walnut shell to remove the old Permachink finish which has failed due to UV damage. This log home video is a how to of log home media blasting a cabin with walnut shell. Colorado Log Home Finishing media blasting a log home near Colorado Springs Colorado. This log home had old Permachink stain which required stripping before refinishing the logs. The cabin had been neglected for many years and uv damage and water had damaged the logs on the log home. After media blasting Log Home Finishing uses sanders and grinders to further prepare and clean the logs on the log home cabin. The final preparation step before applying new log home stain is pressure washing the log home to clean and brighten. Colorado Log Home Finishing media blasting a log home near Colorado Springs Colorado. This log home had old Permachink stain which required stripping before refinishing the logs. The cabin had been neglected for many years and uv damage and water had damaged the logs on the log home. After media blasting Log Home Finishing uses sanders and grinders to further prepare and clean the logs on the log home cabin. The final preparation step before applying new log home stain is pressure washing the log home to clean and brighten. Log Home near Manitou Springs Colorado. Log Home has been media blasted with walnut shell and sanded to remove old Permachink stain from logs. Log Home will be restained with the best log home stain, Sikkens 'Log and Siding'. Log Home Finishing worker Andrew is grinding logs to further remove old stain and prepare wood prior to applying new Sikkens log home stain to this Colorado log home cabin. 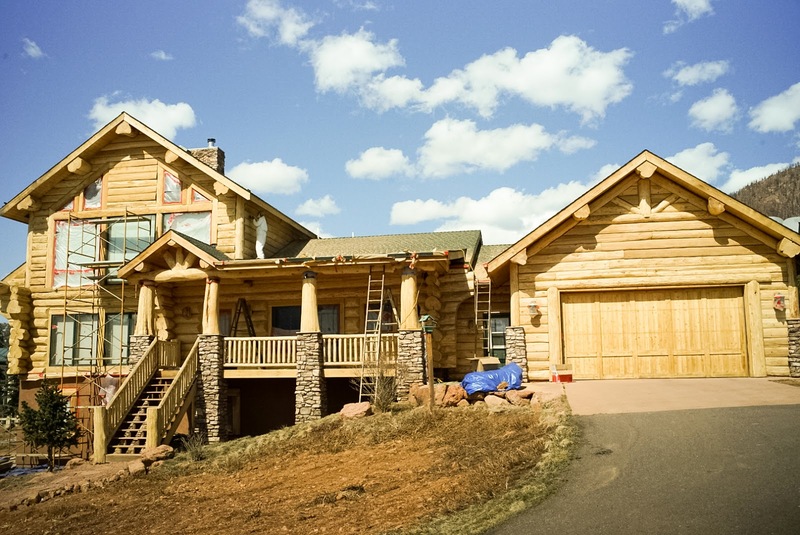 Logs on this log home near Manitou Springs / Colorado Springs Colorado have received extensive treatment as a log home restoration and log home maintenance project. Log Home Finishing for your Colorado log home maintenance and supply Denver. Video of media blasting a log home with walnut shell to remove old finish from this cabin in Colorado. 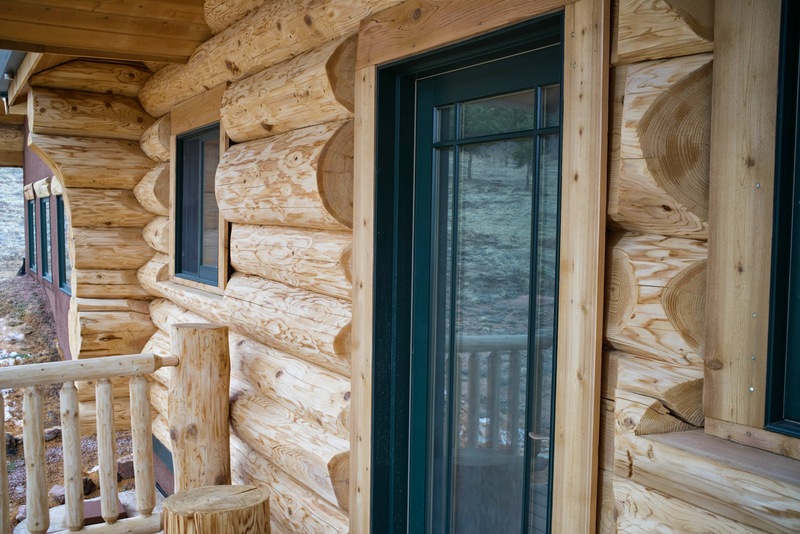 Many times a log home is left for years without proper maintenance or has been re-coated with an incompatible finish. In this situation, media blasting is a technique that Log Home Finishing uses for stripping the old finish, stain, or log rot and UV damage to the log home.